I’m spending the next nine days being as nice as I, personally, am capable of being. I’d love it if you played along! You can check out our plans here, paste your photos on the Yes and Yes Facebook page, email me your related blog posts, or hashtag it out with #9daysofnice. Let me be honest, friends. Today’s bout of niceness was stolen (stolen!) from the pages of USA Today. Last holiday season, ‘layaway angels’ paid off thousands of dollars worth of layaway plans, particularly those including children’s toys. Isn’t that amazing?Of course, children still have birthdays and families still struggle to purchase basic necessities outside of the holiday season, so I thought this would be a nice, easy, anonymous way to engage in a bit of do goodery. After some research, I discovered that Kmart and Sears are two of the only stores that offer layaway year round. So I trundled down to my local Kmart and rather awkwardly explained what I wanted to do. It was a bit strange to explain that no, I didn’t know which plan I wanted to pay off. And, no, I didn’t know these people. And, no, I didn’t want to pay off someone’s collection of The Fast And The Furious dvds. But eventually, we found a good fit. Someone had been paying on a Dora The Explorer sheet/comforter/stuffed toy set for a month. And for $21 I could pay off their layaway plan. For less than the cost of my margarita and burrito the previous night a little girl gets a snuggly, Dora-tastic bed a few weeks earlier. What an easy short cut to feeling good about yourself. And (more importantly) what a good reality check. Next time you find yourself picking up socks/scented candles/house plants at Kmart, I would highly recommend sidling up to that layaway counter and seeing if $20 can make a difference. 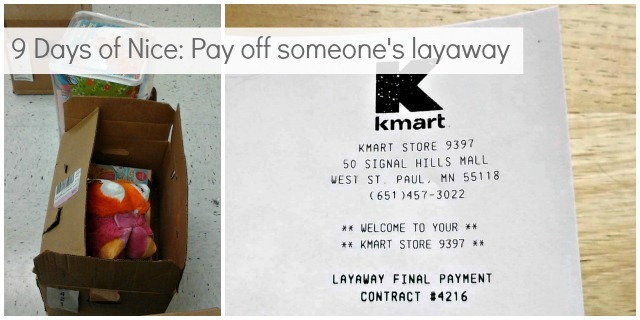 Have you ever paid off someone’s layaway plan? Would you? If you’re playing along and writing about it, send me links to your posts! You are so very, very nice! This is a brilliant idea. Next time I have cash to spare and am at a Kmart or a Sears (neither of which are remotely near me, but I'm close to a Target and they would probably do layaways year-round?) I will definitely look into doing this! I did this in December at KMart! It was a really awesome experience. I had never thought about it before, but my boss suggested doing it at part of my 26 Acts of Kindness project. This is brilliant! I wonder if there's a similar scheme I could do this for in the UK. OMG I have tears in my eyes! Amaaaaazing!!! I bet it wasn't as awkward as you thought while you were explaining what you wanted to do. My father in law is a high-up Kmart man, and they have seen so much of this the past two years that it should be commonplace for lawaway workers by now. It's so sweet to think about some little girl being surprised with her Dora the Explorer sheets. I bet that little girl is beyond ecstatic when that bed comes in, and those parents so grateful. That's such an amazing idea, and one that really makes a difference on an individual level to a stranger. This brings tears to my eyes. Beautiful. When I was a kid and my dad would take me out for lunch, he'd sometimes secretly pay a seniors' bill at the same time as his. I still remember that. This is such a fantastic idea! And now I feel all warm and fuzzy! I've left negative or kind of "ahem..err…I disagree" comments on this blog before–I hope not in a rude way–but nonetheless, they were negative. Of course, I read the blog because overall, I do LIKE it. Very much. So I should probably remedy that negativity by commenting in a positive way.I really appreciated this post and am so glad you did this. It has inspired me to do it in the future. Even though I consider myself dead broke, I do have $20 to spare for someone who is truly less fortunate than I am. Thanks for this post. What a fantastic idea and well done (I wish someone would do that for me)! Layaway is great for those of us who are a bit tight on our budgets but not enough businesses offer it. My sister put me onto http://www.golayby.com and whilst their range is limited at least I can buy things online on layaway whenever I want. Oh, that made me choke up! That's amazing. I literally just teared up reading this, imagining the parents' reaction when Kmart calls them to tell them a kind person has volunteered to pay their plan off. I love this blog and all your work so hard Sarah! I can't imagine how special that little girl (or hey, boy) might feel. You are wonderful, thank you for doing this! This one would never have occurred to me! Great idea Sarah! What a great thing to do. Thanks for sharing this idea – &, of course, for doing it yourself. Hi I am 17 and have $200 left on my layaway at Kmart and only getting paid 2 weeks is very inconvenient with holidays coming up. And this christmas will be very difficult for not only me but also my family. Because this last april we experienced an unexpected death in the family of my grandfather. He was not only the heart and soul of our family but a good provider. It would mean so much to me if someone just helped my family out by maybe even just paying a little. I normally do not ask for handouts from anyone but I am trying so hard to make this christmas the best for my family because they really deserve it considering all of the things we have had to deal with.